I've been writing since the second grade when my teacher called my parents in for a conference because the ghost story I'd written had her a little concerned. By the time I was fourteen years old I was reading every Stephen King book I could find at the public library. I was hooked - I knew I had to be a writer. Since then I've had several stories published and I've had four screenplays optioned by producers in Hollywood. I've written four novels and a collection of short stories (Ancient Enemy, Descendants of Magic, The Summoning, Night Terrors, Ghost Town: a novella, and A Dark Collection: 12 Scary Stories) all of which are available on Amazon/Kindle. I'm also a proud member of the Horror Writers Association. I grew up in Daytona Beach, Florida. But after many travels and adventures, I settled down in Tampa, Florida with my wonderful wife and son, and a stray cat we adopted. Tara Simmons has been running from the Shadow Man, a serial killer, since the night he murdered her parents when she was 16 years old. It has been nine years since that horrendous night, and now the Shadow Man is hunting and playing with her mind again. Their psychic abilities connect, and through his eyes Tara is an unwilling witness to the murders he committed. He’s making his way to her, collecting blood, skin and whatnot from his victims for his ritual – Tara would be the important piece. 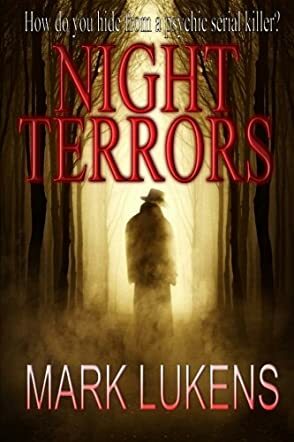 Night Terrors by Mark Lukens is a mystery thriller with a bold streak of paranormal facets. To be frank, I love a good whodunit. The thrill of the chase, mystery, a dark secret, figuring out the clues and the final inexorable proof of the evil of man. Fortunately for me and fans of the genre, Lukens’ book is on top of the benchmark for quality. I had fun trying to guess who the real killer was as I kept reading. Protagonist Tara Simmons, the Shadow Man, the suspicious Agent Woods, Tara’s aunt Katie - Lukens manages to use his writing prose to conjure up a great range of emotions between readers and the strong cast of characters. Given that this suspense paranormal thriller unfolds over just 200 pages, and with Lukens’ strong prose and well-developed characters enhancing its readability, Night Terrors flies the reader to its conclusion swiftly without a hitch. At the end of the book, there’s some indication that the story will continue. I do hope so as this would be a great series.